Anyone who knows the Geeks knows we adore cheese. In fact, next to Taco Tuesday, Fromage Friday is the most important day of the week to us. There is nothing better than enjoying a bottle of wine and a cheese board with a good Found Footage horror movie. Always looking to improve our cheese game we sought out the help of Murray’s Cheese Shops which are located in Fry’s Stores throughout the valley. Founded in 1940 by Murray Greenburg, Murray’s initially only sold fresh mozzarella, olive and tomatoes. In the 70’s, Louis Tudda, a Murray’s clerk bought the shop from Greenburg. It was purchased by its current owner Robert Kaufelt twenty years later and now boasts two New York stand alone locations (The Bleeker Street location has moved three times but always within 100 feet) and numerous in-store locations. 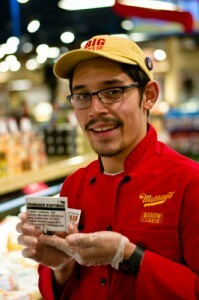 We met with Cheese Monger, Anthony Lujan. Anthony has been with Murray’s for two years and is Red Jacket Certified. This means that he flew to New York and took specialized classes (half cheese education and half customer service). We learned a little bit about anything and some interesting tidbits about working with Murray’s including the fact that there are eight specific ways to cut cheese! First and foremost, be open minded. 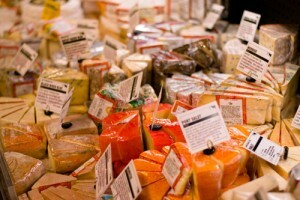 “Cheese is not just cheese.” There are 8 cheese families, which means there is something for everyone. When creating a cheese board, balance is key. You should be able to enjoy both flavors without one overshadowing the other. Pick a flavor or quality you want to showcase. Start mild and then move on to the more wild cheeses. This will allow you to enjoy the flavors more. 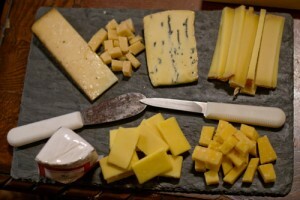 If you are unsure about your cheese board and/or pairings start by picking 2 cheeses that appeal to you. Honey drizzled across bleu cheese is a great way to warm someone up who might otherwise be unsure about it. Don’t make a yuck face (this was one of our favorite tips)! This might give someone the wrong impression and they might miss out on what could become their favorite cheese. The world is your oyster! What is good to one person may not be to someone else and vice versa. We want to thank Anthony, Murray’s Cheese Shop and Fry’s Stores for hosting such a wonderful tasting! We hope to do more with Fry’s and be able to share more experiences, pairings and seasonal favorites with everyone! The only cheese that, I’m digging these days is the goat cheese flavored with blueberries. That’s my go-to snack and I love the texture and taste. Hello fromage friday!! I love the sound of pears and mild cheddar. 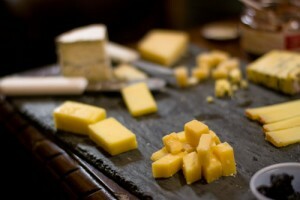 I’ve always wanted to tackle doing a cheeseboard but never know where to start! This helps a bunch thanks!